This recipe is my homemade version of a Graham Cracker (or Graham Wafer). I don't know about you, but I always find it's a lot of fun replicating things that you would normally buy. These homemade Graham Crackers taste pretty close to the original grahams, which are my favorite, so if you want a cinnamon flavor you will need to add some ground cinnamon to the batter. Although Graham Crackers are usually thought of as kid food, I really appreciate these homemade ones with a hot cup of tea. You can also use them to make a great S'more, that delicious snack that takes roasted marshmallows and pieces of chocolate and sandwiches them between two graham crackers. And don't forget that you can crush them and use the crumbs to make a wonderful graham cracker crust. Graham Crackers are flat, rectangular-shaped, slightly sweet and grainy whole wheat cookies that are named after their creator, Rev. Sylvester Graham (1794 - 1851), a United States dietary reformer. Rev. Graham advocated vegetarianism and, in fact, American vegetarianism was called 'Grahamism' in the mid 19th century. He felt that it was very important to eat flour (graham flour, that is) that was made from the whole unrefined grain, including the bran. So when you buy commerically made Graham Crackers they do, in fact, contain graham flour. Now, I find graham flour really hard to find in grocery stores, so technically speaking, this recipe isn't a "real" graham cracker as it doesn't contain graham flour. Instead it uses a combination of whole wheat flour and wheat bran which makes a pretty good substitute for graham flour. I also added some all purpose flour to give the crackers a lighter texture. If you are unfamiliar with whole wheat flour it is flour that is milled from the entire whole wheat berry, so it still contains its bran (fiber) and its germ (rich in oil, protein, iron and vitamins). This makes it rich in fiber and it also has a nutty toasted flavor. Wheat Bran is the outer layer (shell) of the wheat kernel and even when ground it is not considered a flour but a fiber. It adds a mild earthy taste and coarse flaky texture. Unprocessed wheat bran can be found in most grocery stores (on the baking isle or in the organic section) or else in health food stores. However, if you can't find wheat bran then you can subsitute it with 1 1/2 tablespoons (13 grams) of cornmeal (polenta) with excellent results. The Graham Cracker batter is very easy to make. You can make it in your food processor or you can do it by hand. The labor intensive part is if you want them to look exactly like the store bought ones. If you are going to just crush the graham crackers to use in a graham cracker crust then you really don't have to cut and prick the dough so precisely. Homemade Graham Crackers: Place the flours, wheat bran, sugar, baking powder, baking soda, and salt in the bowl of your food processor and process until combined. Add the cold pieces of butter and process until it looks like coarse crumbs. Add the honey, milk, and vanilla extract and process until the batter starts to clump together. Then divide the dough in half. Take half of the dough and roll it between two sheets of parchment or wax paper until it's 10 x 9 inches (25 x 23 cm). As you roll, periodically check the top and bottom sheets of parchment and smooth out any wrinkles. Using a ruler and a sharp knife or pizza cutter, cut the 9 inch (23 cm) width into 4 - 2 1/4 inch (5.5 cm) wide strips. Then cut each strip in half, so each cracker is approximately 2 1/4 inches wide and 5 inches long (5.5 x 12.5 cm). (You will get 8 rectangles from each half of dough.) Slide the dough (and the parchment paper) onto a baking sheet and place in the refrigerator until cold and firm (about 30 minutes). (For faster chilling, place in the freezer for about 15 minutes). Meanwhile, preheat the oven to 350 degrees F (180 degrees C), with the oven rack in the center position. Once chilled, remove from refrigerator and peel off the top piece of parchment paper. To make the graham crackers look like the store bought ones, take a sharp knife and gently cut (score) each rectangle in half lengthwise and crosswise. Then using the tines of a fork or the end of a wooden skewer, make small holes in each rectangle. Bake for about 12 - 15 minutes or until the edges of the graham crackers are golden brown. The longer you bake them the more crisp they will be. Remove from oven and place on a wire rack to completely cool (they will become more crisp as they cool). Store in an airtight container for about a week. 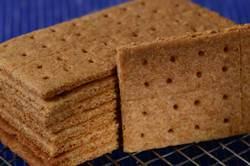 Makes about 16 - 2 1/4 by 5 inch (5.5 x 12.5 cm) Graham Crackers.